Our school horses wear many hats. They're our greatest teachers. They're champions in the show ring. Most importantly, they're our best friends. Kat ("Katrina") is a Dutch Warmblood/Paint mare that came to our farm as a weanling. She's always in demand for IEA and IHSA shows in our region and is very competitive on our local circuit. 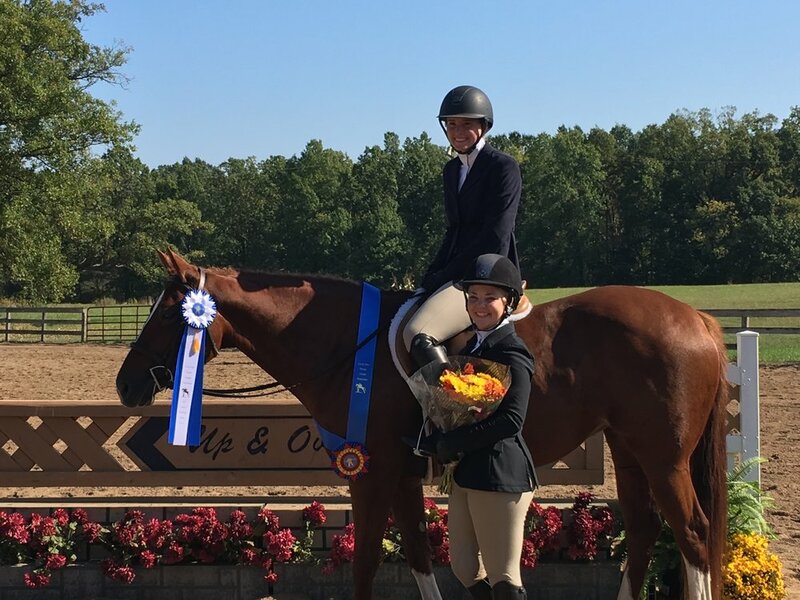 When she's not showing riders how to earn blue ribbons, Kat spends her time teaching young riders how to canter their first jumps, eating Lil' Debbies and trying to give chestnut mares a good name. Noah ("Land Ho!") is an Oldenburg gelding. Although he requires a sensitive ride, students love Noah's smooth, rhythmic canter and easy jump. A familiar face at local circuit shows, Noah's stylish way of going make him hard to beat. When he’s not in the ring, Noah loves hanging out with his best horse friend Marquee and his best human friend Jamie. True ("So True") is a bay Appaloosa mare. Known for her docile nature, True is our go-to horse for teaching riders to walk, trot, canter and jump. Probably one of the sweetest mares you'll ever meet, True puts on her game face when playing broom polo and has been known to bite other horses to keep them away from the ball. True loves getting turned out with her best friends and eating pretty much anything she can get her hooves on. Baloo ("Bare Necessities") is a 16.2h, 12 year old Hanoverian gelding and our resident equine model. After trying his hand at dressage and eventing, Baloo decided hunters was more of his forte and came to Fallowfield to give it a try. A beautiful mover and jumper, Baloo was always destined for greatness. But it wasn't until he started modeling for Big Dees Saddlery that Baloo achieved horse catalog fame. Although he's special, he hasn't let his diva status go to his head. Baloo is a pro at horse shows, especially in the equitation ring (in spite of his bouncy trot). His favorite treats are German Horse Cookies and his best friends are Puppy and Monte. 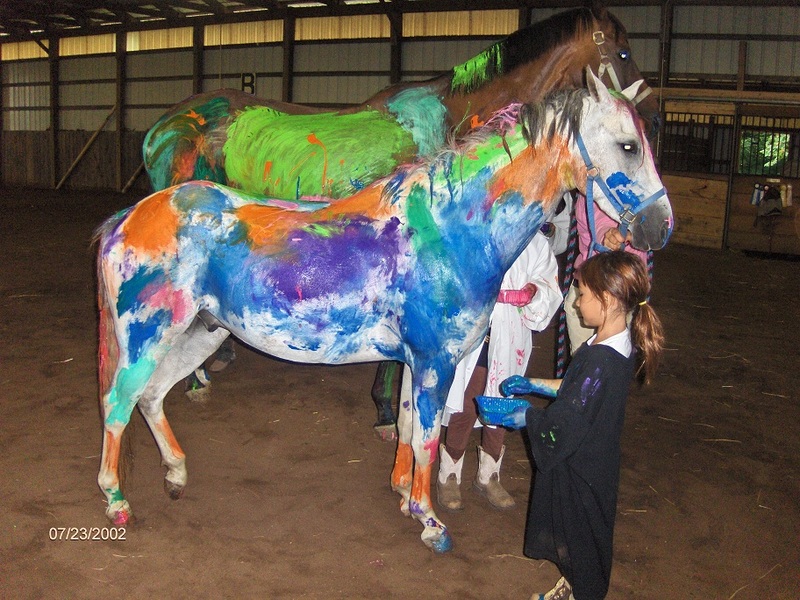 Goose ("Duck, Duck, Goose") is 15.0h Paint mare and a very special young horse. Her smooth, slow movement is ideal for teaching new riders the ropes and she’s a favorite for our Special Olympics riders too. An athlete in the show ring, Goose is making her debut in the Very Green hunters this season. Goose likes to spend her spare time with her best friend Heidi eating as much grass and hay as they can manage. Dingo ("Pillow Fight") is a Welsh Pony gelding that came to our farm by way of a slaughter auction. Although his picture seems to show otherwise, Dingo is not actually blue, orange and purple, but a grey and white pinto. Known for his big personality, Dingo is a favorite of many of our young riders. In addition to jumping huge fences, Dingo's hobbies include being virtually unbeatable at broom polo and eating his favorite treat: bananas. Joker ("Just Foolin' Aroan") is Quarter Horse gelding. Joker is one of the most versatile horses in our program. He can teach our youngest riders how to canter, jump around with the older riders in horse shows and teach our college students how to post the trot. He came to Fallowfield scraggly looking and mostly unbroken, but he has become one of our most dependable lesson horses. Although he has a well-known dislike for girth tightening, he has a gentle soul and is best friends with our oldest and youngest horses at Fallowfield. Sarris ("Davric Eye Candy") is our resident princess. The only pony to get her own photo shoot upon arrival at the farm, Sarris is a diva and likes everyone to know it. Sarris' favorite thing to do is horse show and although she sometimes isn't up for practicing at home, she's known for her extremely smooth gaits and being completely bombproof. Sarris is Daioni’s last foal and they are still the best of friends. Sarris loves peppermints and will do pretty much anything to get one. Pinkie ("Pinkie Swear") is a 16 year old Welsh pony mare. About as wide as she is tall, Pinkie frequently earns questions about when she's going to foal. In spite of these unfortunate comments about her figure, Pinkie still works hard teaching our tiniest riders. At only 10.2 hands, Pinkie might not look like a big horse, but in her mind she's an 18 hand warmblood. Although she loves to canter and jump, her true talents lie in playing basketball and broom polo. Pinkie spends most of her time with Jasmine, our Shetland Pony and loves eating sliced apples. Heidi ("Bear Hug") is a 15 year old Percheron/Thoroughbred mare. She is one of the cornerstones of the lesson program at Fallowfield. Despite her size, Heidi frequently teaches young, timid or special needs riders the ins and outs of riding. At the same time, she is often called upon to teach more advanced riders about jumping and is a frequent winner in the show ring in any company. What most people can't believe about Heidi is that she is naturally very shy and takes a while to warm up to people. Heidi’s favorite foods are apples and cinnamon sugar donuts and her best friend is Goose. Marquee ("Up in Lights") is a 16 year old Paint/Thoroughbred gelding. Marquee came to Fallowfield many years ago for one of our young riders. With her, he found success as a hunter, jumper, eventer and all around good guy. Now we're lucky enough to add him to our lesson program and we hope many riders can continue to learn from his experience. Davric Daioni (Daioni) is a 12.0h Section A Welsh mare and is mom to Sarris. Daioni got her start as a riding pony fairly late in life and was ridden for the first time at age 16 when she arrived at Fallowfield. In spite of this, Dai has proven herself an asset to the lesson program and loves teaching our youngest riders the ropes. Daioni is very competitive in the show ring and is a star in the Crossrails and Short Stirrup Classes. Daioni loves to eat horse cookies and spend time with Sarris and Pinkie. Fingers Crossed (“Oliver”) is a 16h warmblood cross gelding. Oliver came to our farm several years ago with one of our students and earned a permanent spot when it was time for her to head to college. Ollie is known for his athleticism and steady temperament, in and out of the ring. Oliver is not the friendliest with other horses, however and his only friend is Riley. His favorite treats include carrots and peppermints. Slower Than the Rest (“Turtle”) is a 9 year old TB gelding who came to the farm after failed careers as a race horse and a barrel racer. Turtle is known for his massive stride and athletic jump and is always a lot of fun to ride. Turtle has spent some time in the hunter ring, but will be making his debut in the jumpers this year. He also does several tricks including ‘Smile’. Turtle’s favorite treats are sugar cubes and peppermints and his best friends are Puppy and Sunny. Mochachino (“Mocha”) is Appaloosa/Morgan mare who came to us after a short career in eventing. Mocha is known for her smooth gaits and fun jumping style. She’s our newest addition to the lesson program and has already earned herself a permanent spot at Fallowfield. Mocha’s best friend Lady Bug seems to think Mocha is her foal and loves to herd her around the field all day.